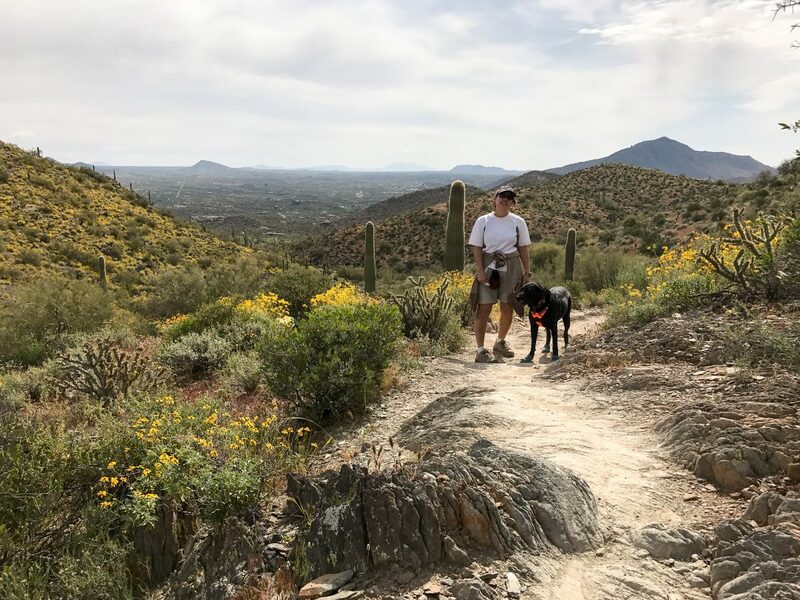 While we usually stay at Catalina State Park when in Tucson, the county and state parks near Phoenix have great reviews so we’ve been slowly trying all of them over the last couple of years. 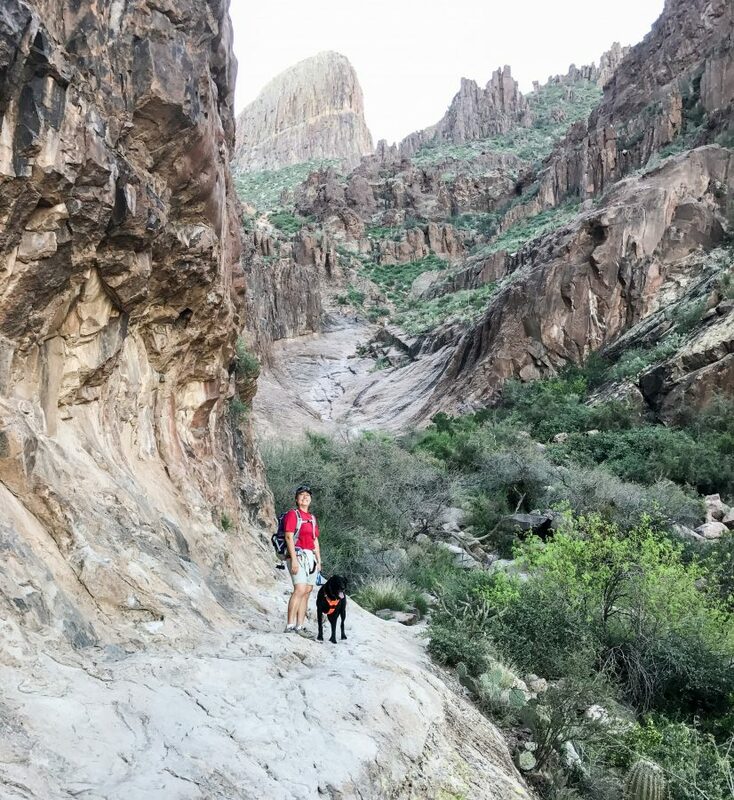 This year we stayed at Lost Dutchman State Park for a week, then Cave Creek Regional Park for a week, which means we’ve finally tried all the ones on our to-do list. 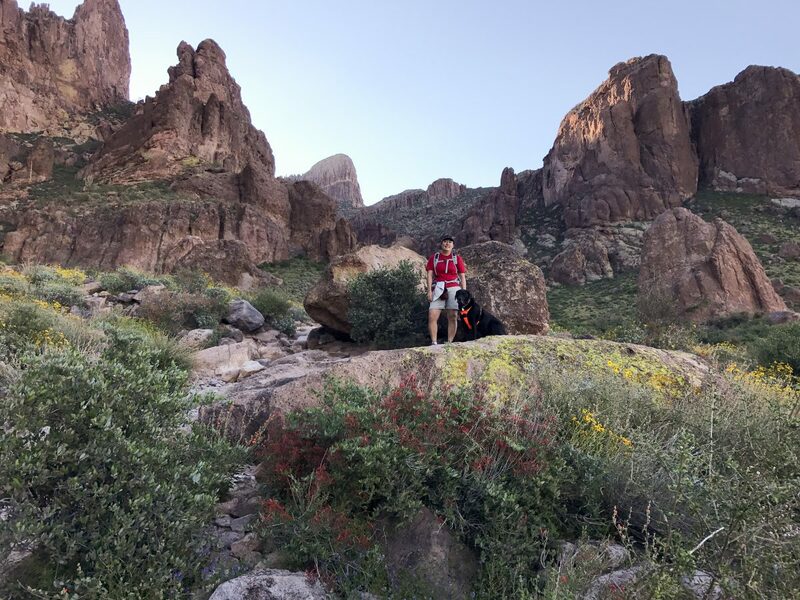 I think my favorites are McDowell Mountain and Lost Dutchman but mostly because the hiking trails are easily accessible right from the campground. Rover parked at Lost Dutchman State Park. 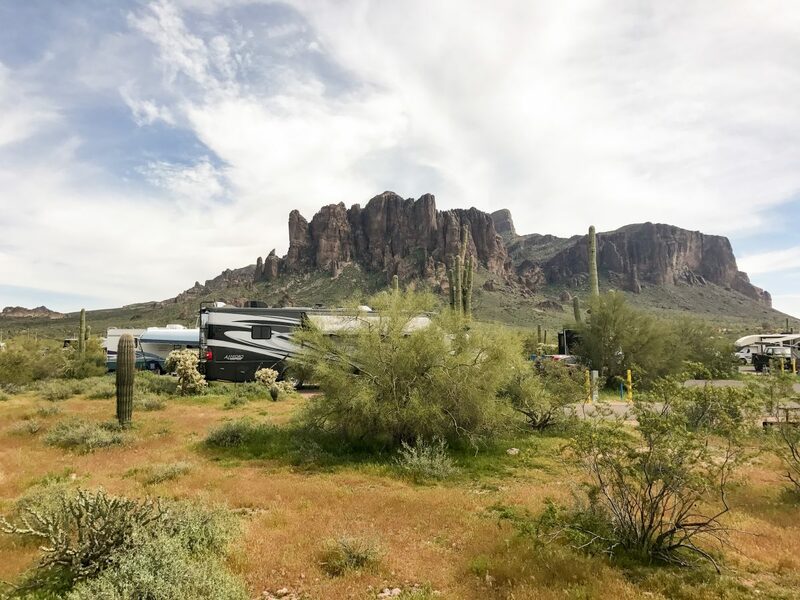 Lost Dutchman is nestled near the Superstition Mountains and named after the Lost Dutchman Gold Mine, a fabled gold mine somewhere in the Superstition Mountains. The campsite has some amazing views of the mountains and Flatiron, a large flat area jutting out from the side resembling a ship’s bow. Spring was starting in Phoenix so huge swaths of wildflowers dotted the landscape, making for some very pretty scenery (and a little more sneezing from us). Heading up the Siphon Draw Trail. 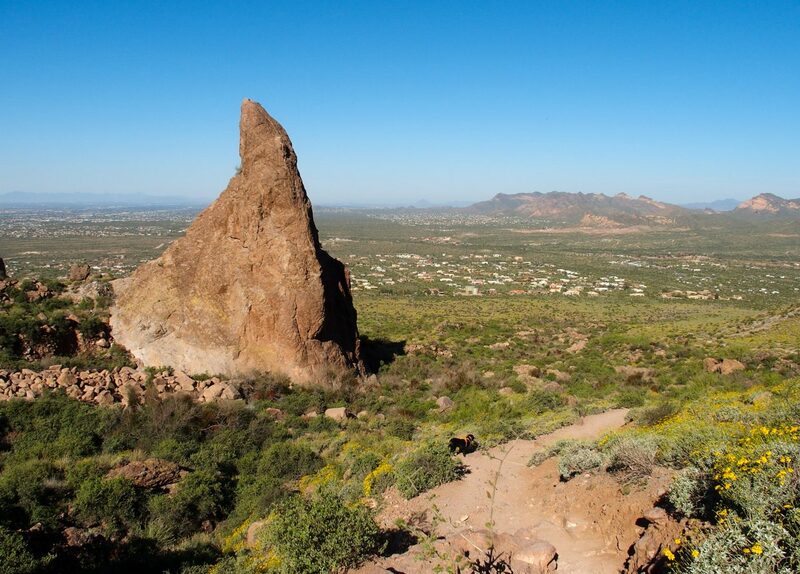 Siphon Draw trail to Flatiron is one of the more popular trails in Phoenix but it is extremely challenging. Siphon Draw to The Basin is about 2 miles and then it’s only 1 more mile to Flatiron but that last mile is the hard part. There’s a 1,700 ft. elevation gain in the last mile, a lot of rock scrambling, with the last 10 yards consisting of a straight climb, called “The Wall”. Since we were there and Flatiron was just staring at us, we decided to give it a go. Siphon Draw gains full sun exposure quickly, so we started at 7am while it was still cool. We found the trail easy with a gentle incline. There is some mild scrambling through rocky areas, but nothing too strenuous. It’s a good trail for any level of hiker up until the Basin. Looking back at Apache Junction from the trail. We made it to the Basin, a slick bowl-shaped rock area where water flows after a rainstorm. After we reached the top of the Basin, Mike and I conferred and realized that it was prudent to stop there and head back down. The rock face is pretty slick and tricky to descend even for Opie, the trail only gets harder from there, and we didn’t want to tire ourselves, make a mistake, and take the “fast way down”. On our way to the basin, visible in the center of the frame. After enjoying the views, we cautiously made our way back down and enjoyed the hike back to the campground. 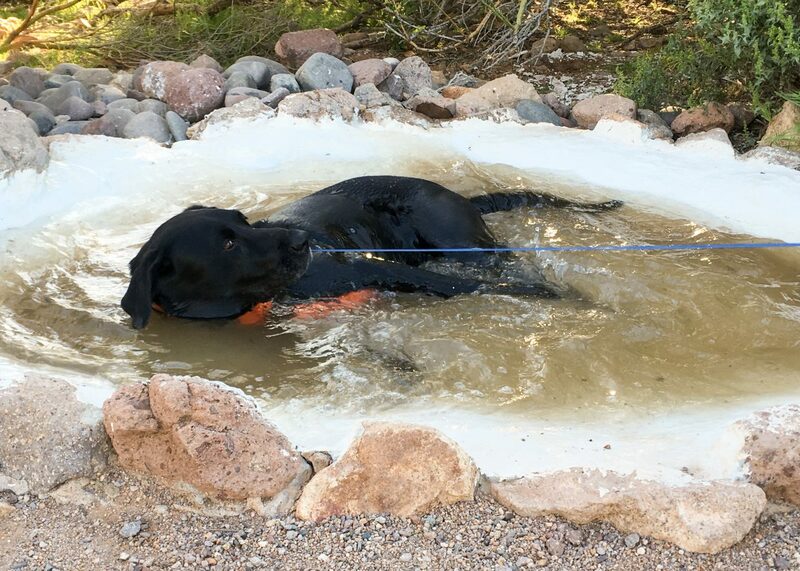 Since we did get some sun on the way down, Opie decided to turn the campground’s birdbath into his own personal pool to cool down. It’s a BIRD bath Opie, not a DOG bath! We did spend a quick few hours at the nearby Goldfield Mine Town, a very touristy ghost town. Originally a miner’s settlement created in 1893, it quickly died after the gold dwindled. The town found new life briefly in the 1920s when new mining equipment was able to recover the remaining ore but died after gold disappeared completely. 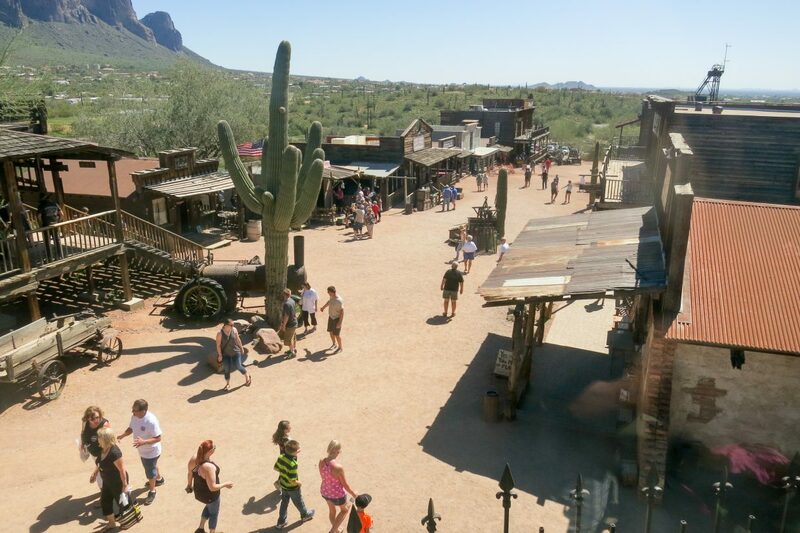 In the late 1980s, a ghost town enthusiast bought 5 acres where the original Goldfield Mill stood and rebuilt the old town. The town now includes shops, livery, jail, church, mine tours, and a bordello. We took the 15 min bordello tour ($3/person) which we found to be fun and informative. We usually avoid these types of touristy stops but it was right near our park, so why not? Other than the bordello tour, there wasn’t much to hold our attention and we left after a short time. 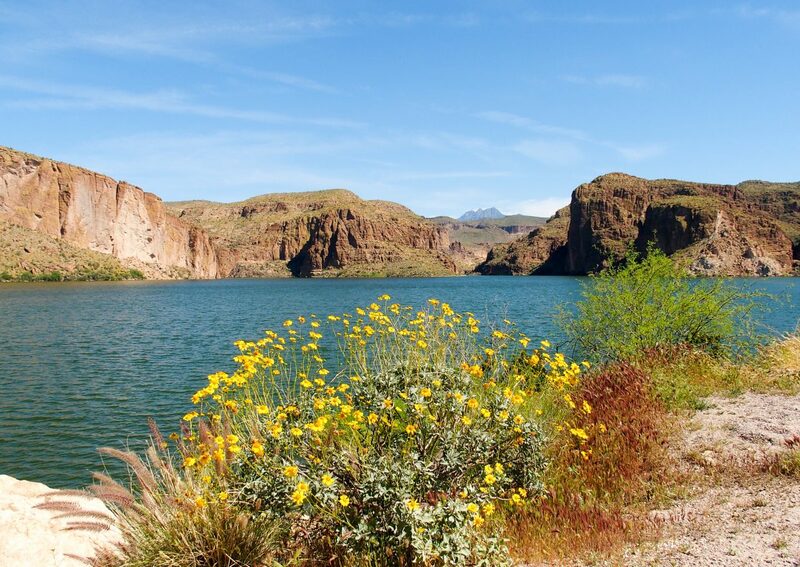 Canyon Lake, along the Apache Trail. 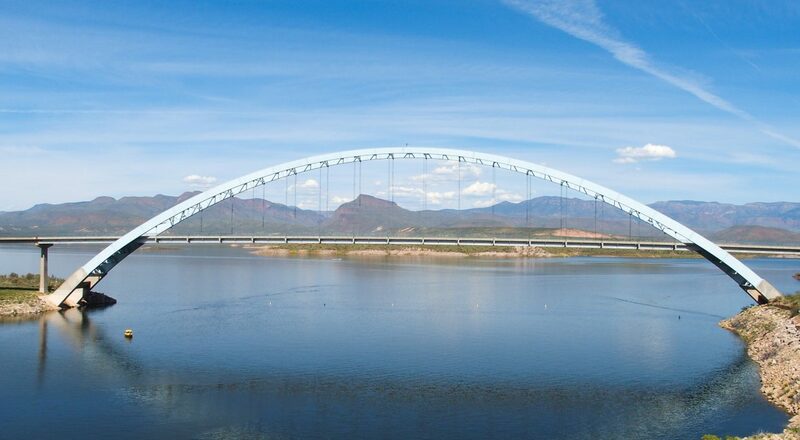 We did, however, enjoy the Apache Trail drive, a 42-mile scenic byway that passed through the Superstition Mountains and Tonto National Forest. The majority of the byway is through some bumpy/washboard dirt roads and some sections are narrow and require yielding to oncoming traffic (make sure you aren’t driving your Lamborghini on this trail). We passed Canyon Lake, gorgeous with huge rock walls towering above the blue water. 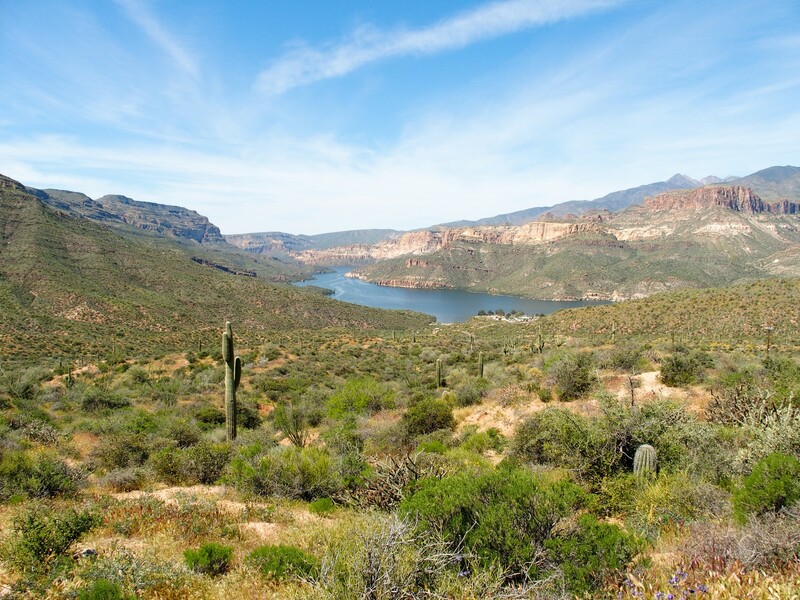 Some of the beautiful scenery along the historic Apache Trail. Tortilla Flats is the last place to get food/shopping before the dirt road starts but it’s probably not worth stopping at unless you’re hungry. The dirt road meanders through canyons and creek beds (almost dry by April) before reaching Theodore Roosevelt Dam, built in 1911 to help control the water flow of the Salt River. The dam is the end of the historic trail. After the dam, we went east on Rt 188 and stopped at Tonto National Monument, home to cliff dwellings, and then headed home. 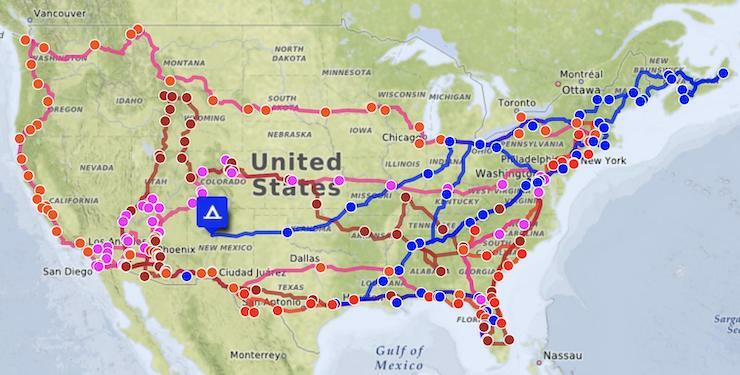 It’s a good 4-5 hours to drive the loop. Bring some water, lunch, a camera, and enjoy the view! 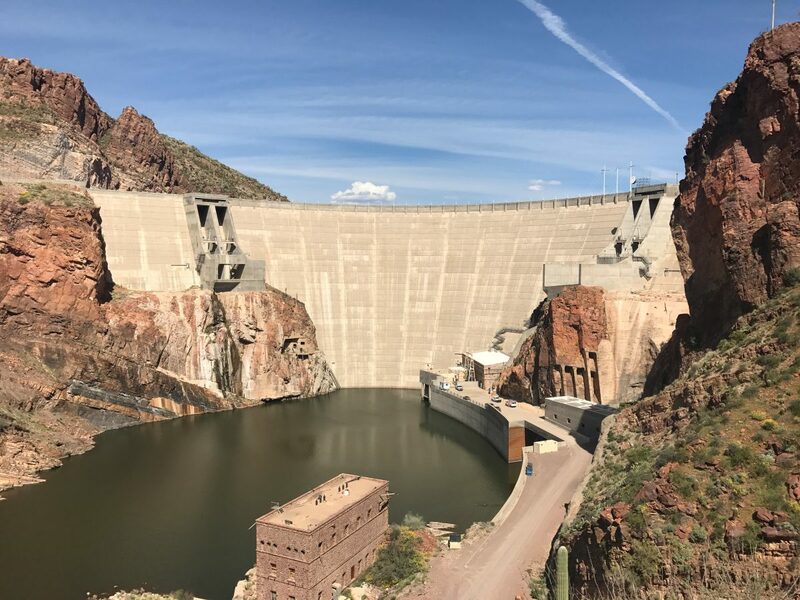 Theodore Roosevelt Dam at one end of the historic Apache Trail. Before we left for Cave Creek, an hour north of Lost Dutchman, we were able to meet up with Debbie and Steve. 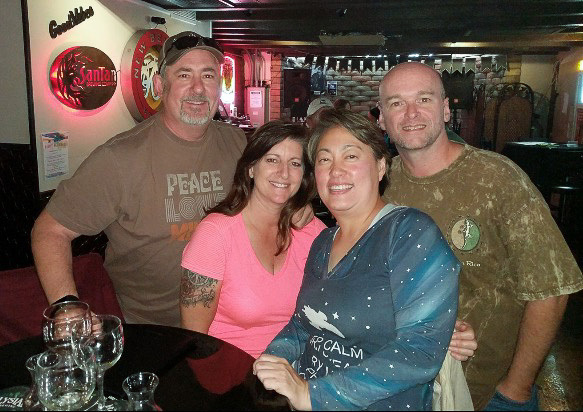 We met them last year in Ouray Colorado so it was fun to catch up again. Their RV had been stuck in the California mud (in their brother’s field) for five months, so they were happy to get out and get back to camping! Drinks and dinner with Steve and Debbie! Once we made it to Cave Creek, we continued to stretch our legs with a few hikes located right inside the park. A 5-mile loop consisting of Clay Mine, Overton, and Go John trails warmed our leg muscles with a 1,000 ft elevation gain and tested our Opie training skills when we ran into a horseback riding party heading towards us. Since the trails are narrow, the horses had to pass by very carefully while we moved as far over as possible. Our dog skills were sorely tested when a couple of the horses lowered their noses to sniff curiously at Opie. Happy to state that Opie did great, although he did side-eye the ones that got too close. We also hiked the 6 mile Go John loop which has a good view of Go John mountain and Tonto National Forest to the east. Thankfully we did not have any horse meet-ups here and our hike ended uneventfully. Hiking Clay Mine and Overton trails. After our nice warm-up hikes, I think we’re ready for Sedona! You guys sure got some amazing hiking in. Opie did very well in the passing of the horses!! Good for you, Opie!! Some amazing scenery in that area!! Thanks! I admit I was nervous about Opie and the horses but he did good! The hiking was nice and the weather was just right! We do like staying in Arizona in the winter time. The scenery is beautiful and the weather is perfect. 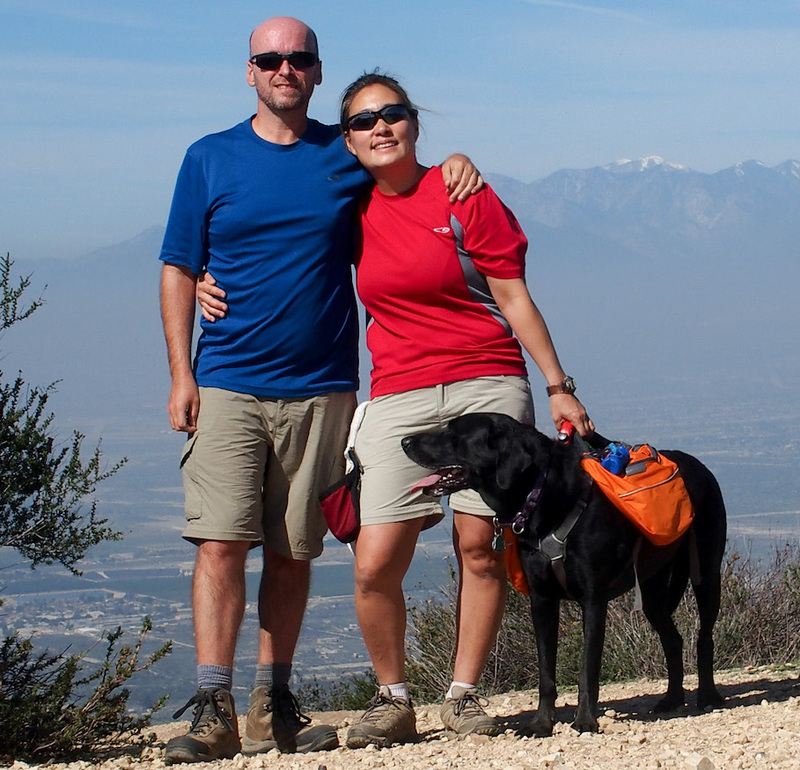 We do like the hiking opportunities of the Phoenix campgrounds! They are a little far from the city so you avoid most of that traffic but on the downside, it does take a little while to get to any nearby supermarkets. 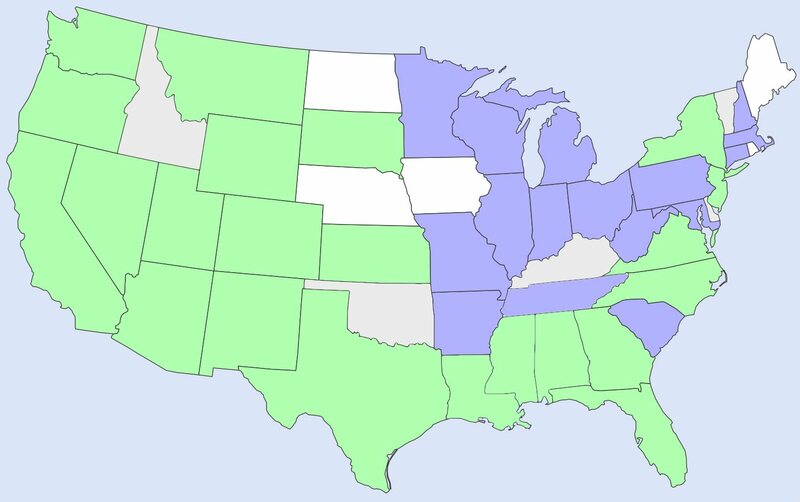 We do have to reserve 3-6 months in advance for these parks if you want more than a couple of days, but it is worth it! Opie will wallow in a mud puddle if that’s the only thing available, so at least the birdbath is mostly water, although I don’t know how the birds felt about it. It was nice to meet y’all at Lost Dutchman. It was great to meet you and Kelly too. Course I still have fond memories of the shrimp appetizer that Kelly made and I can’t wait to make it myself!